An exhibition of pictures from the Museum's art collection. The Museum has an extensive collection of paintings, drawings, engravings, prints and photographs of Stonehenge, dating from the 18th century to the present day. Artists represented in the collection include Frederick Nash, A V Copley Fielding, George Richmond, James Bridges and Henry Moore. The exhibition will show how different artists have been inspired by the monument and how interpretation and emphasis has changed over the years. More modern studies show a bold, often provocative approach, with a greater understanding of the real nature of Stonehenge, contrasting with the (often technically inaccurate) classical Romantic interpretation of the 19th century. The Museum has been fortunate in having recently acquired a number of important works depicting the monument and this exhibition is an opportunity for members of the public to view them for the first time. Stonehenge is Britain’s most iconic archaeological monument, attracting some one million visitors from all over the world each year. It has similarly held a great appeal to artists and was one of the leading artistic symbols of the Romantic movement. Its fame, coupled with its wild setting on Salisbury Plain made Stonehenge popular for English topographical artists, and more recently its cragginess and striking silhouette on the skyline, appeals to photographers. The exhibition opens on 25 May (not 29 March as previously advertised) and will be on show in the Museum's Art Gallery until 1 September. Seeing the half-built visitor centre at Stonehenge raises one big question: how could such a modest, single-storey structure take so long to get built? This project has taken over 20 years to get this far, longer than it took to realise Heathrow Terminal 5 despite being 120 times smaller. Everything about it has generated controversy - the design, the location and the cost (see box - The Stonehenge Saga, below). The whole process has been so agonisingly protracted that far more money has been spent on planning the project than on actually building it. The highly sensitive location on Salisbury Plain is why this visitor centre has taken so long to get to this stage. Located one-and-a-half miles from the 4,500-year-old Neolithic stone circle itself, it sits within the Stonehenge World Heritage Site. 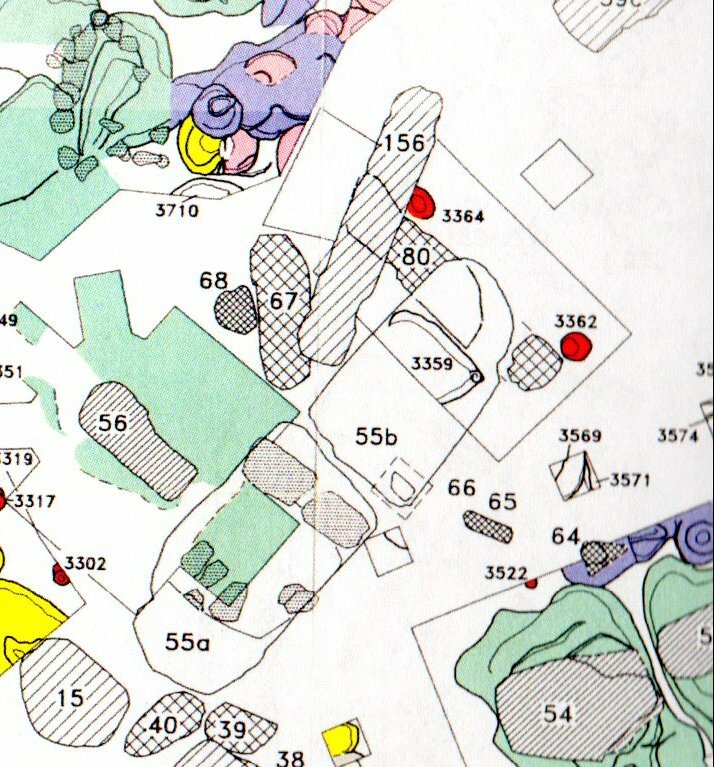 This area is so archeologically sensitive that the centre has been constructed on the topsoil to avoid disturbing the ground. The building is deliberately modest, to minimise its visual impact on the ancient landscape. “We are not pretending to produce an architectural icon here as people aren’t going to the visitor centre for a day out - they are going to Stonehenge,” explains Stephen Quinlan, director of architect Denton Corker Marshall. The visitor centre sits in a shallow hollow and consists of two simple rectangular pods housing a cafe, with retail space and educational facilities plus a smaller ticket booth. Denton Corker Marshall has allowed itself one architectural flourish, to give the building some pizzazz and unify the three pod structures. This is a large canopy supported by a forest of crazily angled struts so it appears to be floating over the pods. 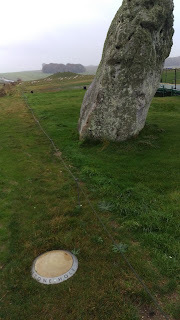 “The countryside near Stonehenge is very undulating and complex,” explains Quinlan. “In a way the canopy is an abstract representation of that undulating landform.” He adds that the columns are angled because arranging the columns vertically in straight lines would be too neo-classical for such an organically shaped roof form. The primary function of the canopy is to keep the sun off the pods. “The cooling loads are substantially reduced by having a sunshade,” explains Quinlan. The building may be simple in concept but has proven a challenge to build. “There are 313 columns and not one of these is plumb,” explains Simon Clark, contractor Vinci’s project manager for the job. He says constructing the canopy has been one of the most complex elements of this job. It measures 78m long by 36m wide and curves upwards from the centre towards the edges like a leaf. This gives the roof its organic form and means there is no need for guttering as the water drains into the middle of the canopy - the aim was to keep the edges of the canopy as thin and ethereal as possible. In practical terms the canopy is 8m high at the south-western and north-eastern corners and curves downwards to a low point defined by a diagonal running from the south-east to north -western corners. This gives the canopy its organic, leaf-shaped curve. The low area running diagonally across the canopy starts off 6m high at the north-eastern end and drops by one metre at the north-western end to create the necessary fall to drain water off the roof. The original plan was to build the steel structure of the pods then erect a bird cage scaffold over these to do the canopy and finish the pods off once the canopy was complete. “The trouble with this is the canopy takes four-to-five months to build which meant we wouldn’t be able to deliver the building to the programme,” says Clark. He came up with an alternative plan that enabled the roof and pod fit-out to be done at the same time. The steel structure of the pods was erected in tandem with a birdcage scaffold covering the entire footprint of the visitor centre. This allowed Vinci to work on the canopy and the pods at the same time. The leaning columns were attached at the base to the slab and located in the final position using the scaffolding. Clark says the scaffold had to be designed so none of the scaffold tubes clashed with the column positions. One hundred short columns extend from the pod structure to support the canopy and brace it against lateral loads. These were fixed in place and the pod roofs built around the columns and waterproofed to allow fit-out work to continue in tandem with the canopy work. “Some of the columns double up as rainwater pipes, which made it more complicated,” says Clark. The new visitor centre forms part of a basket of measures to improve the environment around Stonehenge. This includes closing the A344, which cuts between the existing visitor centre and the stone circle. The new visitor centre will replace the basic, cramped 1968 original. It is located one-and-a-half miles from the monument at Airman’s Corner and will be linked by a motorised shuttle running at regular intervals. The new centre features more car parking space to cope with increased visitor numbers and includes a dedicated coach parking area and reception centre on the other side of the Airman’s Corner access road. The centre consists of two large pods and a small pod housing the ticket office between these under the large canopy. The north pod houses a retail area, cafe and an education space for school groups. The south pod includes an interpretation zone where people can learn about Stonehenge, a space for archaeological artefacts, and toilets. English Heritage is recreating three Neolithic houses outside the centre using the construction techniques of the period. The idea is for visitors to explore these before making their journey to the monument. The main environmental improvement is the closure of the A344 which will improve visitors’ experience of Stonehenge. Currently Stonehenge sits within a triangle bordered by the A303 trunk road, the A344 and A360. The A303/A344 junction will be closed and the other two junctions are being improved to cope with the increased traffic flow. The A344 closes in June and will be reinstated by Vinci as grassland. The final stage of Vinci’s works includes demolishing the old visitor centre, replacing it with an below ground toilet and a security hub. The main roof structure consists of box sections. These are curved to form the roof profile and run perpendicular to the low valley running between the south-east and north-western corners. The box sections are linked by secondary members and are supplied as prefabricated ladder sections. Adjustable U-section heads protruding vertically from the scaffolding were used to support each ladder section in the correct position. These were craned into position and welded to the neighbouring section. The next job was to weld the roof canopy structure to the columns. The whole structure has been welded for maximum stiffness. “The canopy acts as a big sail, which means the wind can get underneath and lift it up,” explains Matthew McNab, technical director of structural engineer SKM. “Bolted connections would have compromised the stiffness of the canopy which would have meant using thicker sections, which wouldn’t have been desirable.” The adjustable U-heads supporting the roof structure were unscrewed, allowing this to drop under its own weight until it met the supporting columns, which were welded to the roof canopy. The canopy will be finished with zinc panels on the underside and a single-ply membrane over the top. These are fixed to plywood sheets, which are supported by timber joists inserted between the steel sections making up the canopy. Each zinc panel is 938mm square and is a 4mm-thick composite consisting of a nylon core faced with a thin sheet of zinc. The panels will run parallel to the canopy edges with the position of all 3,268 panels carefully co-ordinated with the columns. The panels must intersect with the columns on the edges to enable the panels to be easily fixed in place. Getting them to run in perfectly straight lines under the canopy will be tricky. These lines run at a 30º angle to the curve of the roof, making the panels want to curve off course. Vinci will use a laser line to define where each line of panels should go and will use the 8mm gap between them as tolerance to keep them running in a straight line. A lot of thought has gone into keeping the canopy edges thin. The canopy tapers to an edge just 22mm deep. A more delicate steel structure is used around the perimeter. This extends out from the main canopy steelwork and will be supported by columns around the edge. The edge panels have grooves cut into them enabling them to be easily bent around the steelwork for a neat edge. The sensitive nature of the site has made completing the canopy a delicate business. English Heritage wants the visitor centre to sit within a meadow which had to be planted this spring to ensure it will be established in time for the opening at the end of the year. The meadow extends right up to the edge of the building, making access difficult. “Instead of accessing the perimeter of the building with cherry pickers I’ve had to build a 2m-deep cantilevered scaffolding off the main scaffolding to access this part of the roof,” says Clark. Ground excavations have also been carefully controlled because of the risk of disturbing the rich archaeology of the site. “Whenever we go near the ground with a shovel or machine we need an archaeologist watching over us,” says Clark. Piling was out of the question so the visitor centre has been built onto the ground. Fortunately the chalk substrate is a stable material to build on. The hollow where the visitor centre is located was levelled using up to 2m of stones laid straight over the topsoil. Ductwork for services was laid within this fill and a 300mm deep raft foundation cast on top. Clark is confident the building will be finished on time in December despite the difficulties presented by the cold, windy weather. The pod fit-out is under way, the zinc panels and the weathered chestnut cladding to the pods are about to go on. The building’s completion will mark the winter solstice and the end of a very long, protracted saga. It has taken over 20 years to realise the Stonehenge visitor centre in a saga costing at least £37.8m - considerably more than the £27m final scheme. Road improvements are a key part of the Stonehenge plan. The A344 runs close to the site, but a bigger problem is the A303 trunk road, which passes to the south and is a key route linking London to the South-west. This blights the area and is also a major bottleneck as much of the road has now been upgraded to dual carriageway. 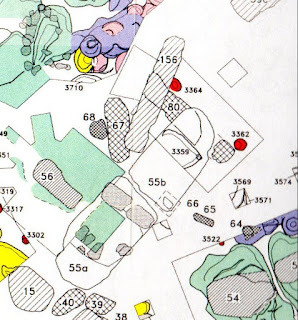 1985 English Heritage announces it wants to build a new visitor centre at Larkhill, half a mile from the stone circle. 1986 Stonehenge is designated a World Heritage Site. 1992 An international design competition is won by Edward Cullinan Architects for a new visitor centre at Larkhill. But the idea is blocked by site owner the Ministry of Defence who are against allowing the public access to the area. The Cullinan proposal includes closing the A344. 1995 A Highways Agency-convened conference agrees putting the A303 in a 2.5 mile long bored tunnel is the best solution to the road blight problem. 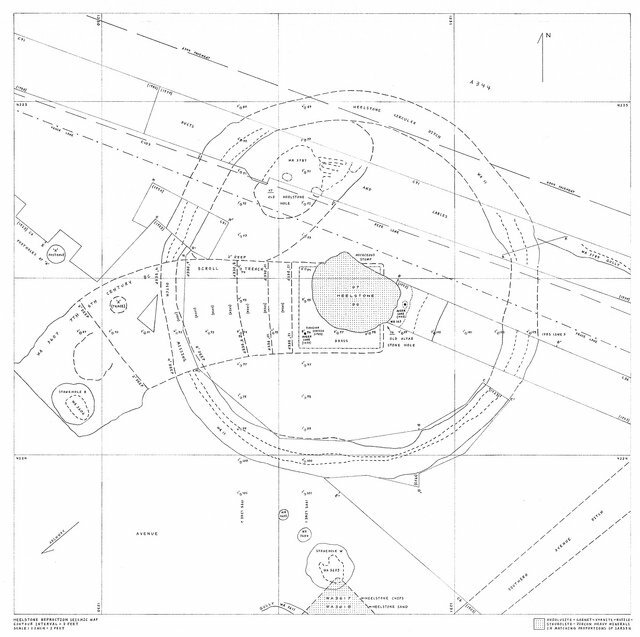 1996 The department of transport rules out the bored tunnel plan on grounds of cost. Tussauds Group consortium is selected as preferred bidder to build a new visitor centre. The £83m scheme includes clearing away all traces of modern man from around Stonehenge and grassing over the A344. It is to be financed by a combination of PFI money and £22m from the Millennium Commission. 1997 The Millennium Commission declines to fund the scheme. 1998 The government agrees to fund the upgrading of the A303 by running a dual carriageway through a £125m cut-and-cover tunnel. This generates fierce opposition as it would damage the rich archaeology in this area. 1999 Five firms including Edward Cullinan Architects and Sidell Gibson are shortlisted by English Heritage to develop a PFI-funded visitor centre at Countess East. 2000 English Heritage scraps the idea as it decides it wants to directly operate the centre itself. Shortly afterwards English Heritage announces yet another design competition. 2001 Denton Corker Marshall wins design competition. 2002 The government announces a £183m, 1.3 mile long bored tunnel for the A303. 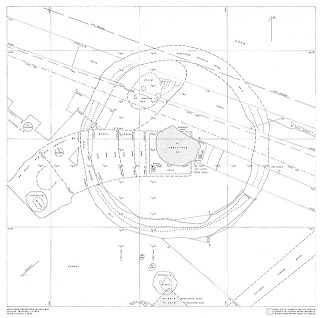 2007 After a public inquiry into the £65m visitor centre proposals, planning permission is granted on the condition the bored tunnel goes ahead. Eight months later the tunnel is cancelled as the cost escalates to £540m. Proposals to build a temporary visitor centre at nearby Fargo Plantation in time for the Olympics come to nothing. 2008 Robert Key, MP for Salisbury reveals the transport and culture departments has spent £37.8m on working up the various improvements to date. 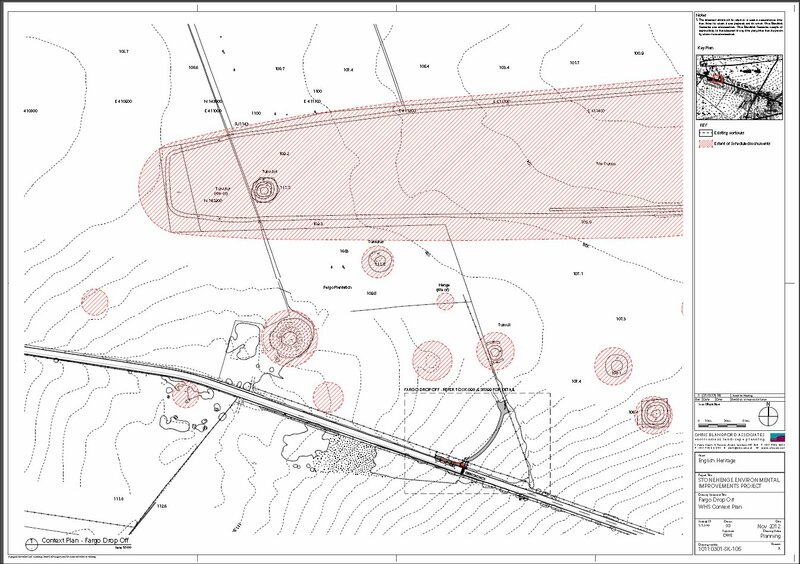 2009 The Department for Culture, Media and Sport announces that the visitor centre will now be built at Airman’s Corner, 1.5 miles from the stone circle. 2010 The new design, also by Denton Corker Marshall, for a £27m scheme wins planning permission. 2012 Work only now starts, due to difficulties securing funding. Can anyone access these papers, my JSTOR access doesn't seem to cover Nature articles? 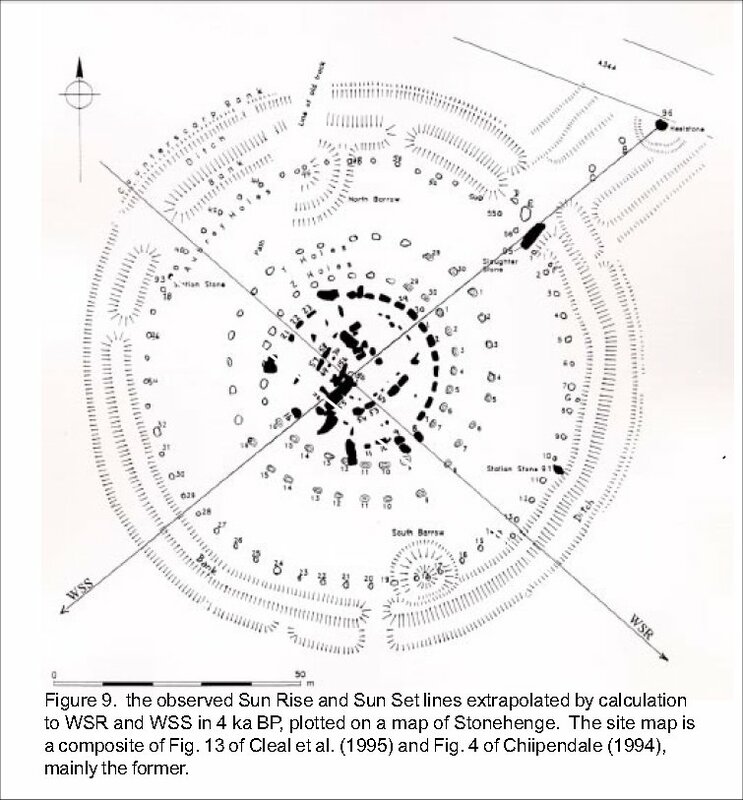 THE possible astronomical significance of Stonehenge has made it desirable to make new measurements of some of its features, and I report here the results of a survey made in April 1978. 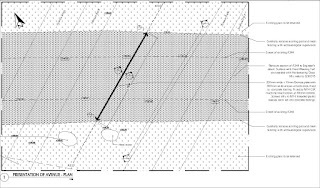 New values are given for the axis of symmetry of the Avenue, the figure of the four Stations, the original position of the peak of the Heel Stone and the axis of symmetry of the sarsen trilithons (Fig. 1). In view of the years of careful study that have been devoted to Stonehenge it may seem unlikely that any more information could be extracted from the monument, or at least from that part of it above ground. During the past two years, however, further markings have come to light that are, at least, interesting, and possibly important. These markings are a series of at least 11 pits on the upper surfaces of the three contiguous lintels (130, 101 and 102) that span the well-known line of sight from the centre of the sarsen circle north-eastward towards the heel stone. For an observer diametrically across the circle, 9 of these pits identify directions of the rising moon at significant points in its 18.6-yr cycle. 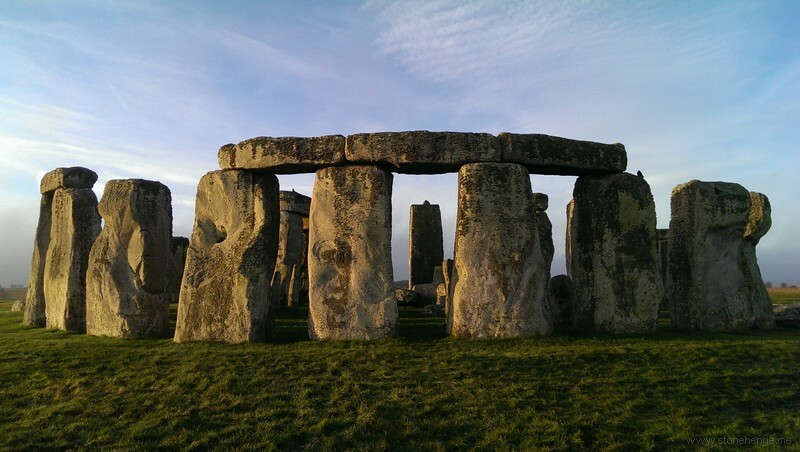 Did Saving Stonehenge Dismantle Private Property Rights? Below are some extracts from an interesting article on how the Lubbock's Preservation of Ancient Monument Bill was a watershed in the rights of private property and the State's power over it and its owner. Before it was passed an owner's right to do as he wanted to with his property was largely unhindered by the state. Sir John's bill was narrowly focused, but its opponents warned it was a slippery slope eroding property rights. The view that private property rights were too important to be meddled with was the excepted view of society. The strong version of this view is now almost completely absent from political circles, all the slippery slope examples, and many more, have come to pass and we live in a nation with very different views on the inviolability of private property. Joseph L. Sax, Is Anyone Minding Stonehenge--The Origins of Cultural Property Protection in England, 78 Cal. L. Rev. 1543 (1990). Sir John drafted his bill to be as uncontroversial as possible. It established a commission with authority to designate important antiquities as ancient monuments. The owners of any such designated monument would thereafter be obligated to notify the government, and offer it the monument for purchase, before undertaking construction on the site. If the government decided not to exercise its right of purchase, the owners were free to go forward with their work. The owners were entitled to full compensation. Last, in order to intrude as little as possible on the private lives of the landowners, all inhabited places, dwellings, gardens, and parks were excluded from the bill's coverage. Despite its seeming restraint, the Ancient Monuments bill generated a fire storm of opposition. Sir John pressed unsuccessfully for its enactment every year for ten years. When a monuments law finally passed in 1882, it had been stripped of its strongest provisions, concerning notice and compulsory purchase. Under the bill that was finally enacted, the government could do no more than purchase from a willing seller should the Treasury deign to provide any money for that purpose, accept the role of guardian of designated monuments at the behest of an owner, or accept monuments deeded or willed to the government by private owners. His was the first piece of legislation in the Anglo-American world' to embrace two related principles: that the protection of cultural property was a governmental duty, and that public ownership and control should be brought to bear on unwilling proprietors. The Ancient Monuments bill shifted the line between public and private authority a considerable distance for that time. 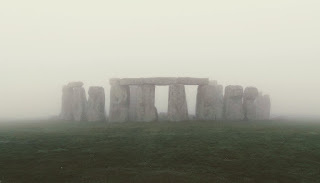 A Member of Parliament expressed the contemporary dissatisfaction with the Lubbock bill, as experienced by the proprietor of Stonehenge: "[He] had done his best to protect that 'ancient monument,' and.., objected to having the jurisdiction over his own property taken out of his hands." The Lubbock bill invoked the quite different picture of an expanding government with an open-ended cultural program. If they adopted the principle of the Bill in this respect, where was its application to cease? If they were going to preserve at the expense of private rights everything which happened to be of interest to the public, why should they confine the legislation to those ancient monuments?... Why should they not equally provide for preservation of the mediaeval monuments-of those old abbeys and castles which were quite as interesting as the Druidical remains? And why should they stop even there? Why not impose restrictions on the owners of pictures or statues which might be of great national interest? If the owner of the "Three Marys" or of Gainsborough's "Blue Boy" proposed to send it out of the country, were they to prevent him, on the ground that the matter was one of national concern? If they said that a certain circle of stones was of such national interest that an interference with private rights was justifiable in order to preserve it, might they not also say that a certain row of beech trees on a man's estate which gave great pleasure to persons passing by ought in the same manner to be preserved? It took less than a hundred years until the fanciful examples the Attorney General put forward became common realities. The government of England does provide for the preservation of medieval structures, restrict the exportation of famous paintings, and preserve forests. England also has a special and extensive law that permits the adoption of "tree preservation orders," precisely to protect features such as rows of aesthetically pleasing beech trees. English Heritage have marked the position of Stone Hole 97 with a very handsome marker. 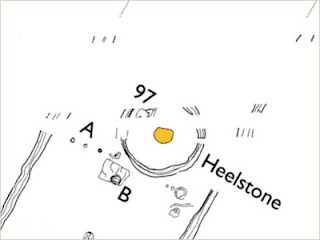 Stone hole 97 was discovered by Mike Pitts in 1979 and is alongside the Heel Stone, it may be where a companion stone to the Heel Stone stood, or where the Heel Stone was moved from. 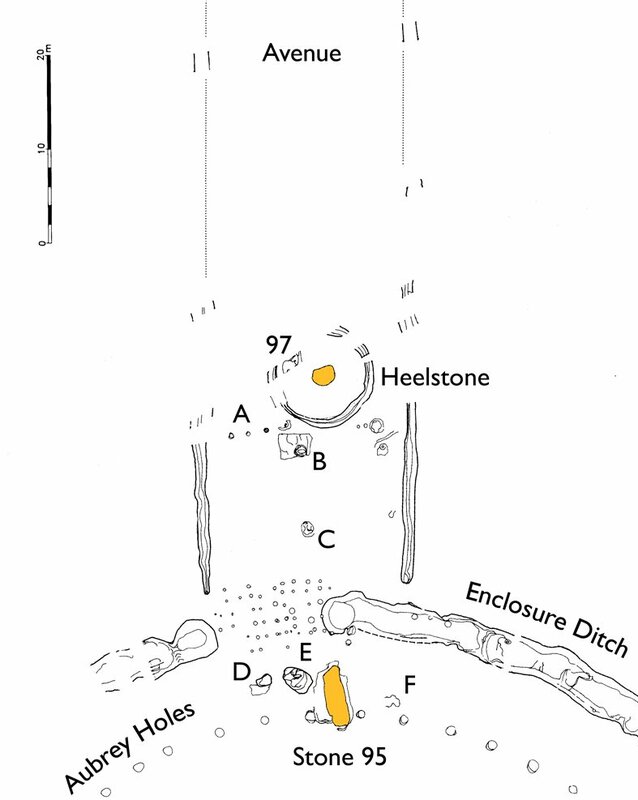 The centre of it is abut 2m from the nearest point of the heel stone and is "cut through by the ditch around the Heelstone", with it mainly lying within the ditch enclosure. Unfortunately the marker is about 5m from the Heel Stone and entirely without the ditch enclosure. If it marks where the second of a pair of stone stood the effect of two pillars bracketing the solstitial sunrise is now not obvious. 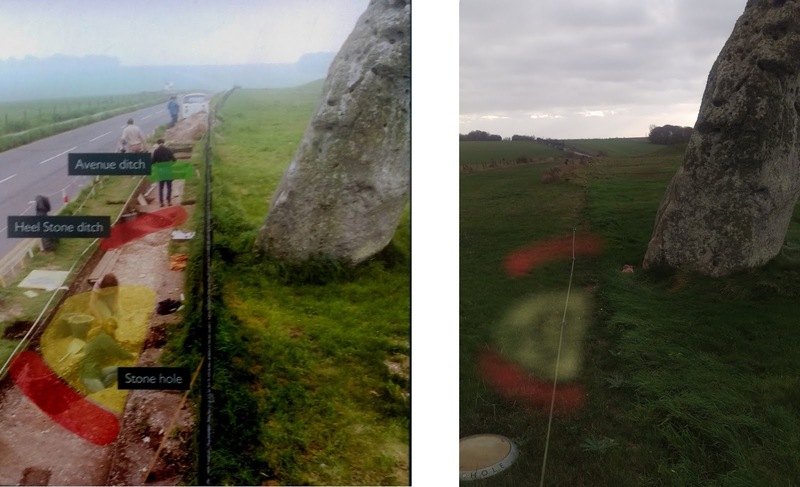 One of the improvements that is planned for Stonehenge is the marking of Stone Hole 97 and the Solstitial Alignment on the ground. But the plans seem to have 97 marked in the wrong place. UPDATE - EH say the mistake has been noted and will be corrected. 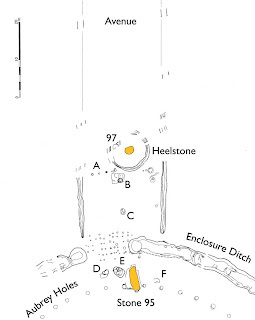 A more detailed plan of the Heel Stone area, though I haven't located the original source. 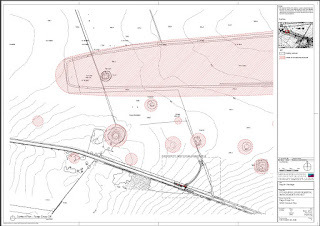 A detailed plan (click to embiggen) of the clump of barrows (and a henge) in the Fargo Plantation from the planning application doscumentation - http://southplanning.wiltshire.gov.uk/public-planning-application-documents/00540500/00540343_Amended_Plan.pdf Follow the link for a larger version. ""This research set out to investigate the nature and extent of prehistoric human activity in the Vale of Pewsey, Wiltshire, a relatively poorly understood area located between the Marlborough Downs and Salisbury Plain. This was to be achieved through a combination of archival reassessment, aerial photographic interpretation and non-intrusive fieldwork. It became obvious that the Vale was the location for a considerable density of Late Bronze Age/Early Iron Age sites, many of which were so called “midden” or “black-earth “sites, and this report concentrates on this period. A survey of some 240 square km of the Vale was undertaken and the results analysed in the context of the few black-earth sites in the area that had previously been investigated. A number of well preserved sites dating from this period were identified and surveyed for the first time and fragments of the late prehistoric landscape defined and discussed. Recent interpretations of Casterley Camp as a hill-top enclosure of this period were investigated and challenged as a result of fieldwork. The nature of the Late Bronze Age/Early Iron Age subsistence system and society in this area are discussed and ethnographic comparables offered. The formation and meaning of black-earth sites and the role of these sites in the contemporary society discussed. 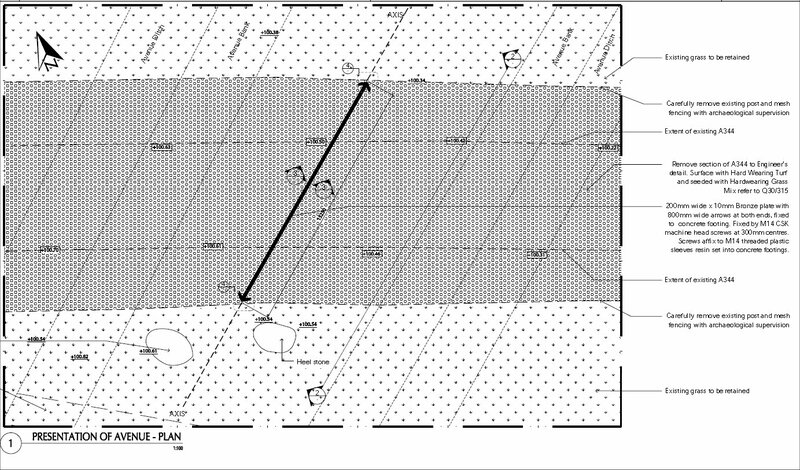 The apparent uniqueness of the concentration of sites in the Vale of Pewsey is considered by comparison with other areas of Late Bronze Age/Early Iron Age activity in southern Britain and, finally, suggestions for future work in the area are made."" Lots about All Cannings Cross (the site I own!) and other sites - download and enjoy. The Altar Stone - A Fallen Stone or Original Sunrise Marker? 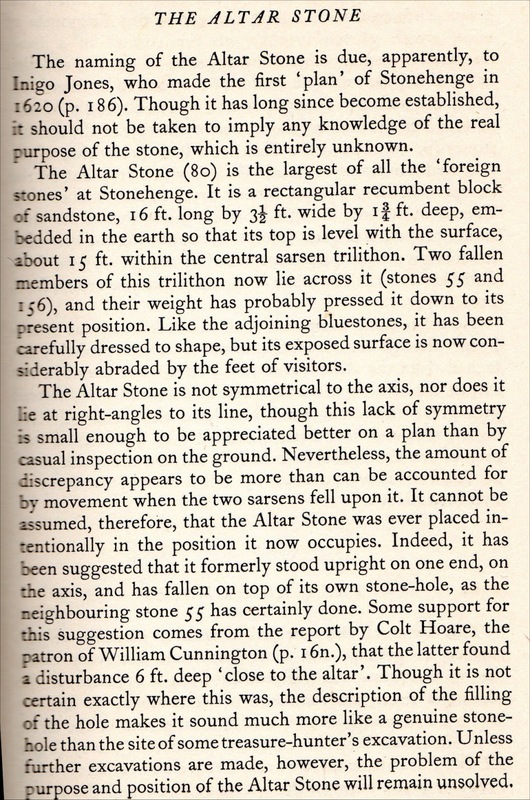 A few clippings about the Altar Stone. Because it lies skewed across the Summer Solstitial Sunrise it has been assumed it is a fallen stone. But no hole has been found for it and it is hard to see how it fell in to its present position if it was a central marker. 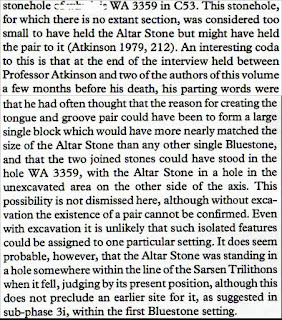 Atkinson wondered if it was part of a pair - see below - but there seems to be little evidence for this theory. I think the consensus view is coming round to believing it is is substantially in its original position and orientation. Gordon Freeman points out that this skewed position aligns it to the Winter Solstitial Sunrise as well as crossing the Summer one. 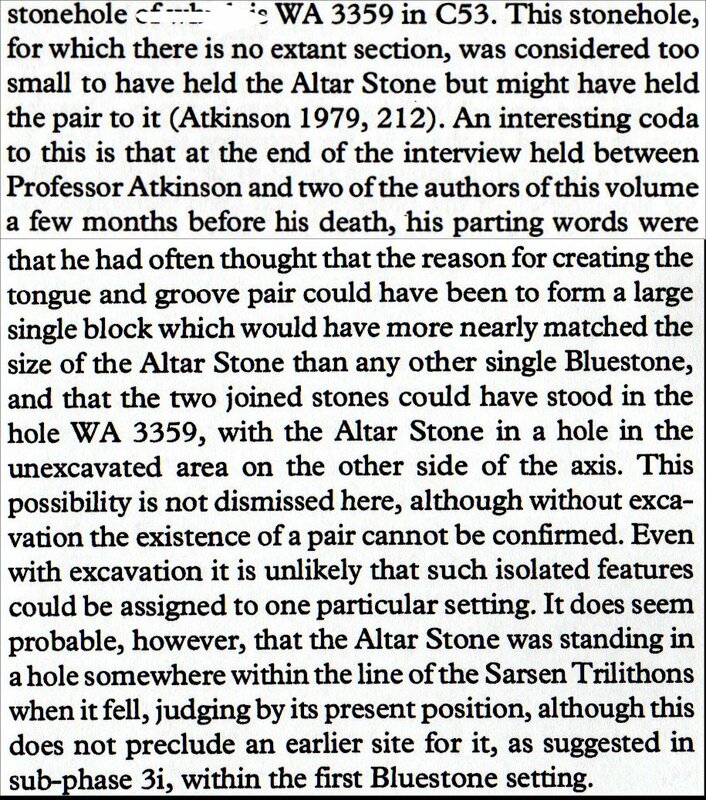 This happens to be the same argument I make about the Great Trilithon which is parallel to the Altar Stone - see http://www.sarsen.org/2012/07/stonehenge-resurrection-alignment.html. Intriguingly there are two post holes marked to the north-west of the Altar Stone. Further north-west the ground has been too disturbed by early excavations but could they be the corners of a platform or other structure also so aligned? purpose of the stone, which is entirely unknown. considerably abraded by the feet of visitors. purpose and position of the Altar Stone will remain unsolved. sub-phase 3i, within the first Bluestone setting. 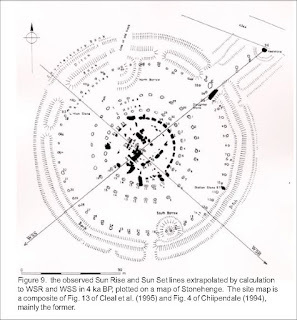 A Winter Solstice Sun Rise observation line crosses the Sarsen Circle between Sarsens 21 and 22, through the Trilithon gap 57-58, past the NE edge of Bluestone 69, above and parallel to the Altar Stone80, past the NE edge of Trilithon Sarsen 53 and the SW edge of Circle Sarsen 8.
probably pushed downward when 55 fell on it. Excerpts from David Field's emails. slopes and in the stream and presumably many more were once visible when the area was cultivated. As you rightly say, none of these are large in trilithon terms, but then neither are any of those on the Marlborough Downs where they rarely exceed a couple of metres – three at the most. The big ones there seem to have been reserved for the Cove and blocking stones at West Kennet. The survival of many on the Marlborough Downs can be put down to lack of agriculture (it’s a degree colder there than Salisbury Plain) for they get in the way of ploughs and soon get cleared and broken up or buried. You can trace the clearance process at Overton/Fyfield from undisturbed sarsens on the summits, to the clearance to field edges to create ‘Celtic’ Fields in the Bronze Age on the upper slopes, to the development of lyncheted fields that cover the sarsens around the edge in the Roman and medieval periods on the lower slopes. If the same processes took place on Salisbury Plain where there was widespread agriculture in Roman, medieval and post-medieval times there will be many other sarsens buried beneath the field lynchets. I think that regarding statistical pattern of distribution based on size frequency the Marlborough Downs would have it as there are so few around Stonehenge. But the difference between a three metre and five metre sarsen is quite dramatic and I imagine that just one in either place could shift the balance. Its perhaps worth noting, though, that the heelstone is not exactly small and because of its shape few people will argue that it was brought from far. 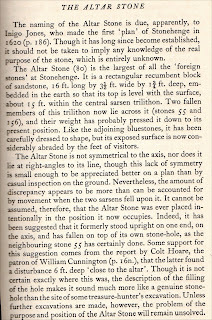 Edward Pegler's blog also has an interesting argument about the origin of the Bluestones, and the water at Avebury, as well as lots of other stuff!